One thing integral to Camelot Unchained is the expansive, living world where our Backers will vie for control. Over the last couple of weeks, and especially this week, we’ve made major inroads into the tech to support that expansive, living world. At the start of the month, we began working with our portal tech to allow players to teleport between zones, primarily to make testing easier. However, we delayed more expanded testing of that tech, as we still needed something… Specifically, the two big changes that dropped this week. First off, there’s the WIP first pass of the seamless zone transition work from Colin. To test this, Ben set up two small islands with a small bridge between them. Crossing that bridge literally allows your character to transition from one physical server to another, seamlessly and with no loading screen. Hype aside, we still have work to do to improve this, and to allow more of the game mechanics (such as stances and combat) to persist between servers better, but it’s a huge step forward in creating the world of Camelot Unchained. Second, and more pertinent to teleporting, is the very large change to terrain generation. After all, you need terrain under your feet to get to the teleporter, and terrain to be there when you arrive at your destination! George and Brad integrated the terrain gen code into our threading library, which removed many possibilities for crashes and deadlocks. This update also paves the way for one of our Beta 1 items: terrain updates based on Realm control. All in all, it’s been another busy and good week here at CSE. If you’d like to catch our livestream of the week’s highlights with Tim and myself (Tyler), including an unboxing of an amazing gift, you can catch that HERE. For the text version of the week’s highlights, let’s hit our Top Tenish, shall we? WIP – Tech – Seamless zone transitions: In last week’s update, we spoke about the new tech for seamless zone transitions, which was going through review. This week, we’ve put in the first part and completed some preliminary testing. Currently, the zone transition boundaries are manually placed. Colin continues to work on an automatic boundary setup (instead of the current manual implementation). Remember, this allows players to move between different physical servers with no load screen! Tech – Terrain and ParLL update: Brad and George landed a large change this week that focused on overall stability by making use of, and adding to, George’s threading library. This change fixes over a dozen deadlocks and crashes in the old code, improves the world editor experience for the team, and makes the code easier to debug for future fixes and improvements. WIP – Tech – VFX system improvements: Per last week’s update, using Order Independent Transparency to render particles gave us a big boost, but illustrated the next bottlenecks to improve VFX performance further. This week, George dropped in the precursor to his next update, something he and Andrew have been discussing at length. Dave and Bull continue working with George and Andrew to tackle performance from a different angle. Tech – Encumbrance: We’ve landed the first pass of encumbrance, which Ben will begin testing. Now, when players do actions like equip an item, add or remove an item from inventory, log in, or respawn, an encumbrance active effect will be recalculated and reapplied. This is one step closer to checking this off our Primary Beta 1 list. We are still planning on looking at Banes and Boons to take advantage of this new feature. Tech – Cross-office workflow improvements: The Seattle team has had a very productive week with Andrew, who went over there to visit the west-coast office! The team has had plenty of mutual mindshare time to discuss current and future work around many topics and disciplines. One of his primary focuses was to improve the local server startup time for the Seattle team, which was previously 7-8 minutes. With Bull’s help, he’s gotten that to around 2 minutes! One small step, multiplied per engineer out in Seattle, to improve efficiency. WIP – Tech – Bring bots back to life: We’ve added several new features since our last 1500-Bot test. Marc is dusting the cobwebs off to make sure Bots still work as expected. As stated previously, our Bots are not NPCs. Our Bots act very much like players do, particularly on the server, in order to stress test our various systems. In fact, they sometimes can better stress our systems better than real players would! 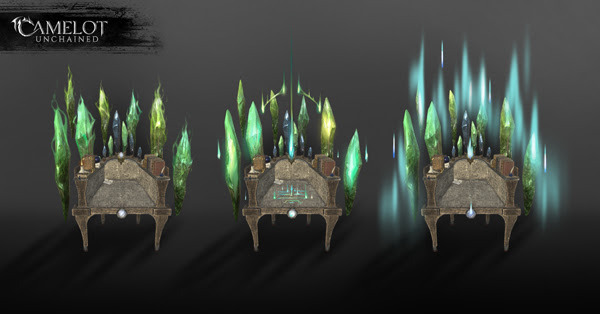 As of this week, we are determining the future work needed to bring them up to speed with recent features, such as multi-zone portals, crafting, etc. Art – Environment: This week, Dionne completed several more stumps, logs, and branches to fill out our current asset roster. 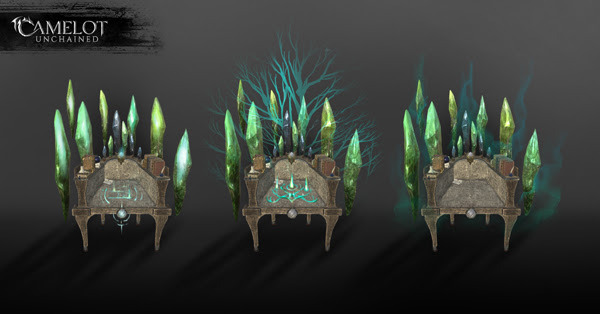 These will help to make our forests not only more realistic, but also provide more variation to impact gameplay. Tyler has begun working on new beach assets, and looking for performance improvements in the pine forest while adding in new tree variations. Art – Animation: Using Andrew’s updated animation system, Scott set up left arm overrides for carrying torches when using the three different Realm standing idles. This tech has been a huge time saver: Part of the animation system allows us to sort of “Frankenstein” different parts of animations together. We can and will put time into new animations in places where this doesn’t work as well as we’d like, but for simple things such as the above, it has been great! 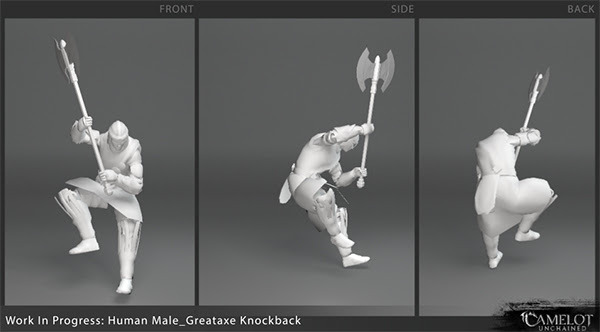 Art – WIP Animation: Scott has begun working on large and small knockback animations. You can catch some of that work from his live stream this week HERE, and the WIP render of a larger knockback HERE. Sandra has continued refining the myriad of animations necessary for polearms, which have been updated in the game for a further audit next week. 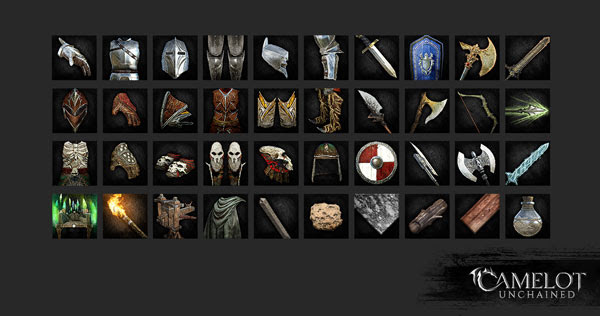 Art – UI Icons: James has completed icons for miscellaneous items and crafting materials for our new UI for Beta 1. This follows completing the weapon and armor icons from last week. 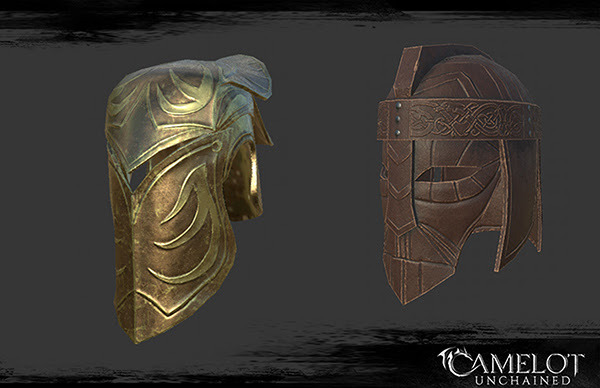 Art – Armor: Following up work from last week, Jon completed several more helmet models for more variation in Beta 1. Check out the images in today’s update! Art/Tech UI: Michelle completed the next pass and consequent review of the health bar UI elements. We quickly honed in on what worked, and you can see some of that work in today’s update. Imagine getting thrown through the air with full server-side physics! These will go well with some of those smaller knockbacks Scott started this week. Up next, icons! While we do expect the styling and overall UI to change and grow throughout testing, we’re going to need something to start with. James has wrapped up armor, weapon, and crafting icons for use during Beta 1. 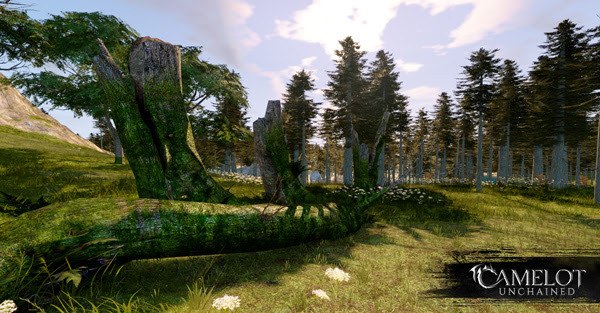 As mentioned above, Dionne has been busy creating new forest assets for a touch of realism and variation. Notice the lichen on the log in the foreground, and the small ferns growing on the stumps! 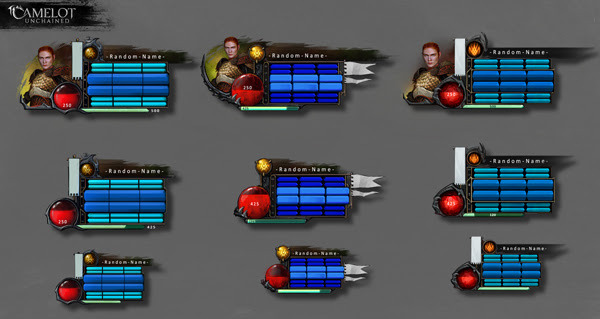 Next up, we’ve got the latest iteration of health bar UI concepts from Michelle. Below, we’ve got a few sketches of VFX concepts for the Vox, also from Michelle. 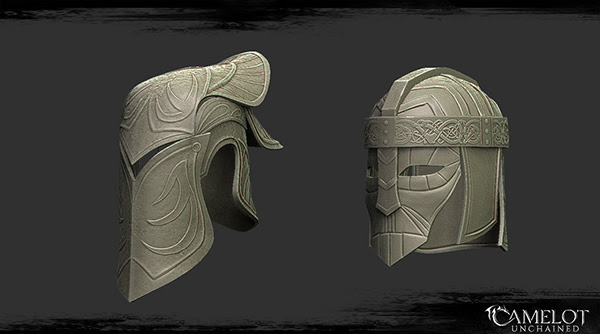 Getting towards the end, we have some awesome helmets, inspired by real-life historical helmets. These are from Jon, before and after materials are applied. Imagine crafting these! We’ve still got to rig these and add them to the game, but when we do, you can run around in some new bling! 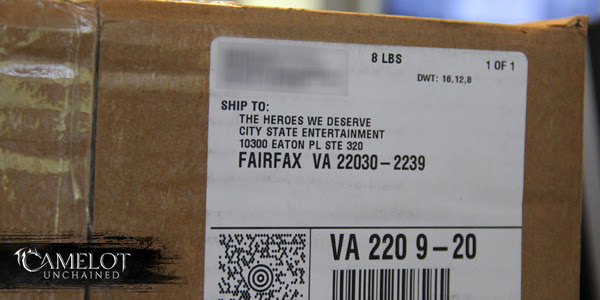 To wrap up the week, we’ve received an incredible gift from a fan called Speely, a gift we unboxed at the end of today’s stream. This came not only with a great, heartfelt card, but a great address label, too! 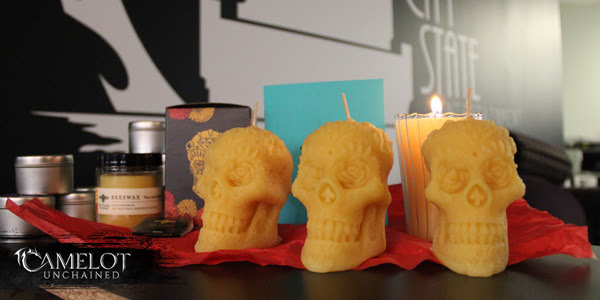 The contents included a pretty awesome array of handmade beeswax candles and oils! Check out the skulls! Thank you for very very much for the great gift! That wraps up another good week here at CSE. As per the livestream, we’ll have a follow-up email for alpha and IT testers this weekend. Beta testers, we haven’t forgotten you! Once we get some more mileage on some of the newer features, we’ll get a build out to you. In the meantime, have a great weekend, all!